What are Others Saying About Outside Hilton Head's Shopping Experiences? ★★★★★ Upon our families visit to Outside Hilton Head it was immediately evident that your Captain, Amee Patrick, was incredible with children. She has a way of telling stories and has the ability to arouse enthusiasm among my grandchildren like no other guide/retail staff I've come in contact with. The time she spent with Grant and Maddie was innately unique to someone who not just connects with youth but empowers them. In life, our society is constantly responding to the demands of the environment we live in and rarely takes time to help plan for an extraordinary quality of life. Our time in Outside Hilton Head's retail store was so much more than our merchandise purchases. In my wide association, meeting with many great people in various parts of the world, I would like to commend Mr. Overton in clearly employing the best in his personnel. Rarely does a shopping experience extend this caliber of substance. Outside does. Captain Amee does. We would love to hire her as our guide for every day of our visit. - Sarah W.
★★★★★ We were so happy to have found our way into your store. Amee was was so sweet with my children and offered many great suggestions of fun things to do around the island. We are looking forward to a kayak tour this week. - Laura L.
★★★★★ Amee was so sweet and helpful. She was extremely patient in helping fit by boys in Chaco sandals as well as myself and my husband. Great selection and knowledgeable staff- would definitely come back! 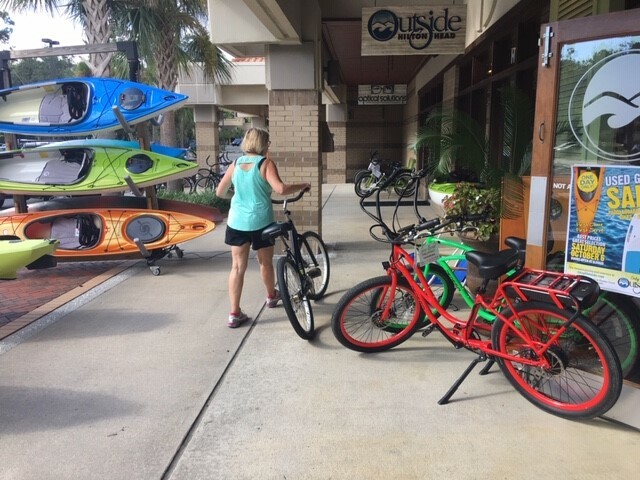 - Mary R.
★★★★★ Always love shopping at Outside Hilton Head. Had a really nice afternoon there and Amee went out of her way to make it special. She helped me pick out a new pair of eye bobs! Great service, great store. ★★★★★ I live on Hilton Head Island and I was looking for clothes that are the right weight and style for the island. I found wonderful long wide legged pants and a fabulous top. They were made by Hard Tail. That's a wonderful line. Damaris did a good job helping me. - Chelsea D.
★★★★★ I needed some tie down straps to haul all of my beach equipment- had had never used any before and Lisa K was fabulous in explaining how to use them. Fun store with a variety of merchandise. - Debbie S.